Rainbows has now finished for the year - we had a Christmas party last week, with two girls making their Promise and another being given her Pot of Gold as she is heading up to Brownies in the new year. Guiding hasn't completely finished for me this year though - there is still quite a bit to do for Iceland! In January we're having our first pre-weekend - this means we're having a weekend away in a Guiding venue with all the girls and leaders going on the trip. This will be the first time we've been together as a group, and we haven't all been together since the INTOPS weekend earlier this summer, way back before the girls knew where they could be going! Back in October the leaders of all three region trips met up at Foxlease to talk about all manner of things - from risk assessments to fundraising, to emergency procedures and paperwork. It was great to see everyone again and we were all incredibly excited to find out which girls were going on which trip. It did remind us though just how much work we have ahead of us. Guiding trips don't just happen - they are a lot of hard work. I've got a box file full of bits and pieces already, and a folder on my laptop. I've got budget sheets, forms approving the trip, forms giving me permission to lead it, copies of letters sent to charitable trusts asking for financial support (fingers crossed!). Whilst planning the main trip we're also planning the January weekend, so there are forms going round for one thing whilst I'm trying to keep on top of the forms for the other! Today I need to send round the parental consent forms for the January weekend as I've realised with Christmas coming up there is really less time than I thought! It's all going well, though, all these forms and policies are in place for everyone's safety and well-being and I have three fab leaders who are doing well at replying to my plethora of emails and Whatsapp messages. The risk assessment has been approved and we've started buying materials for activities and soon we'll need to book in the supermarket order. How many toilet rolls and pints of milk do we need? 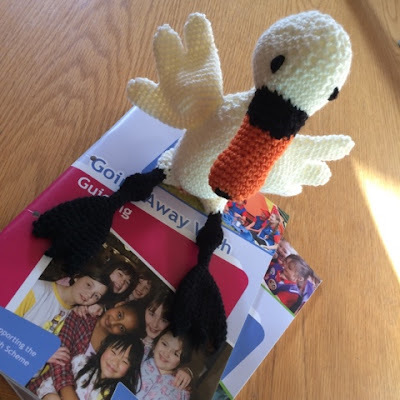 No trip is complete without a group mascot, and I crocheted a swan for #TeamIceland. I was going through Edward's Mengarie: Birds book and trying to think what would be most Icelandic. I prefer the birds to the mammals as I think they're better for posing for photographs. In the end I went with a swan - not exactly the most Iceland animal ever but I did some research and some breeds of swan do stop over in Iceland when they're on their migration routes, so it's not too unbelievable. Anyway it's a crocheted toy, realism isn't essential! The other leaders wholeheartedly approved (yay!) and we've decided it's a she, but the girls can choose her name when we meet in January. One of my lovely friends, G, is a Brownie leader and she was a leader on an international trip this summer - she has made the swan her very own camp blanket (oh yes!) and is also making her a teeny tiny international necker for her to wear. Well, if you're going to have a mascot you may as well do it properly!